Week 10 - 2016: Baldwin caught three touchdown passes including the game-winning score on Sunday Night Football. The Seahawks defeated the Patriots 31-24 in New England. Not true lol I've spent over $1,000 on packs this year and I have not pulled a single LTD card. In what PACK can you get this card? For real, still haven't pulled a LTD I mostly believe these are a myth. Seahawks Passing game is crazy this year now, Jerry Rice, Doug Baldwin, Golden Tate, Jimmy Graham, and Franco Harris from the backfield. Adding Seahawks Pass Defense Chemistry adds Catch to all receivers as well. 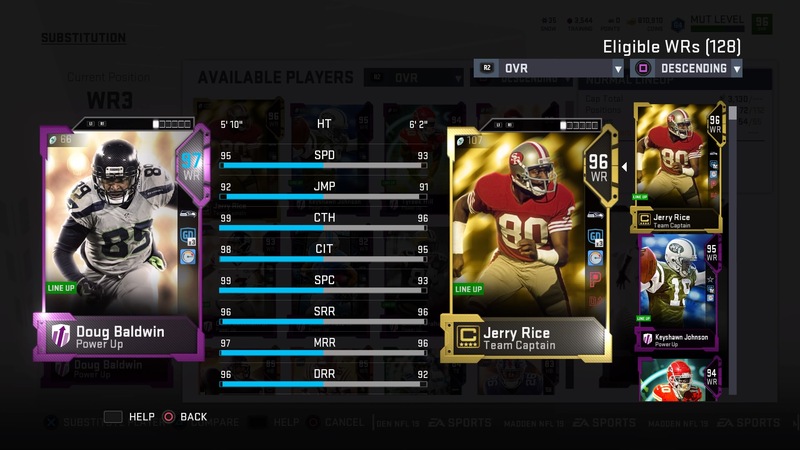 A 95 speed 99 catch, on Seahawks theme team tier 8. Dougy B man this card will have 99 catch and 98 catch in traffic with west coast! !if I wish really hard can I pull this? If you become a streamer, get a large following of youthful players that have access to their mom's credit card, and subtly convince them to buy packs, then I'm sure EA will reward you with one for being as they like to call it an "influencer"
I'd like to add Passing D but I'm still trying to load up on Passing O to get Russ to 90 DAC. Graham and Baldwin have 99 SPC on my squad though, they're fun to watch! Way too much conversation about pack odds and not nearly enough about how good this card is. I've used every version of him all year long and great is an understatement. He just catches everything. In traffic, in the clutch, even some deep routes and high points. Speed and ag catching are crutches. This guy is a baller. Me too, I've spent alot of money, not sure if it's over 1,000 because I didn't count. I haven't pulled 1 single ltd. Guess it is time to get a ton of training points for Bobby Wagner and Doug Baldwin. Both are LTD which is actually kinda nice because then it is POSSIBLE to get these cards. Still gonna cost an arm and a leg in training.